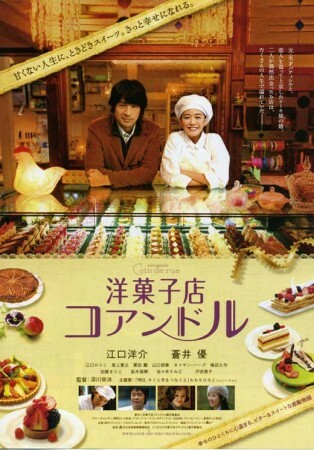 On Saturday I went to see the delicious movie Patisserie Coin De Rue (part of the Japanese Film Festival). 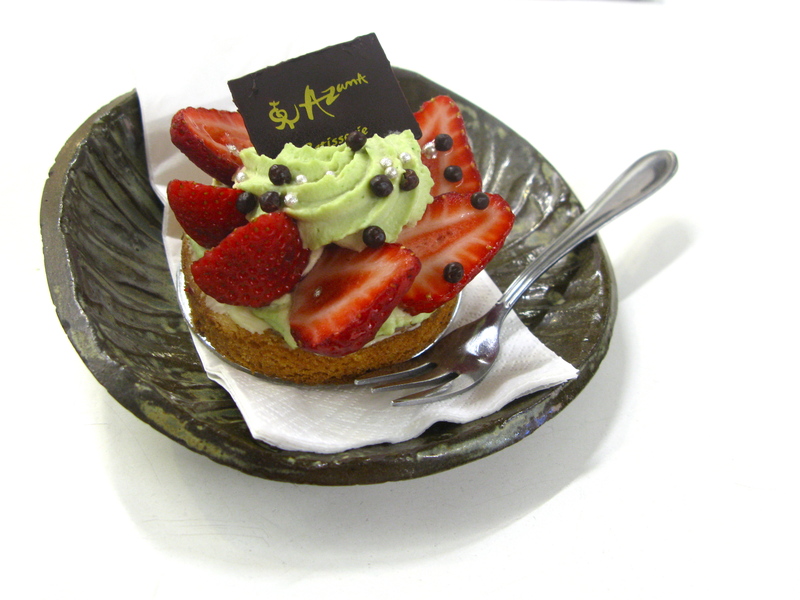 Because we knew the film would make us crave all manner of cakes, tarts and patisserie-style treats, Lee Tran, Ben, Anna and I agreed to a pre-movie dessert date at Azuma Patisserie. 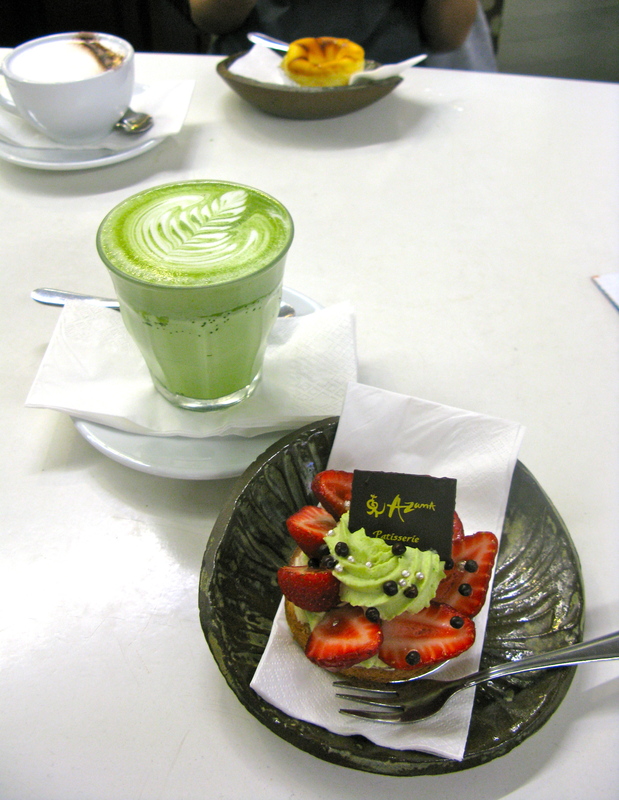 I tried their Pistachio and Strawberry Tart (above) and a matcha latte. They have a cake & hot drink set for $8.90! In a reversal of when I arrived in Japan and was enthusiastically biting into green cakes assuming they were pistachio flavoured, on first glance I thought this tart was green tea flavoured. The decadent pistachio créme is balanced by fresh, juicy strawberries, while crunchy chocolate balls and a biscuit base add yummy texture. Anna sampled their baked cheesecake and white hot chocolate, while Ben and LT enjoyed their green tea & vanilla frozen yogurt with chopped strawberries, which looked almost as cute as Pinkberry. We were glad we had indulged because the film included a dizzying amount of extreme close-ups of cakes being slathered in glossy ganache, creme brulees being torched, vanilla bean custards being stirred over a hot stove and Marie-Antoinette grade millefeuille being constructed. I think the lead actress, Yu Aoi from Hula Girls, is lovely, and she was very convincing as a wide-eyed but whiny Gen-Y apprentice, as I don’t think she’s the slightest bit whiny in real life. I’d give this movie 4 stars out of 5. Watch a trailer for it here. This entry was written by prettyprettyyumyum, posted on November 21, 2011 at 8:57 pm, filed under yum yum. Bookmark the permalink. Follow any comments here with the RSS feed for this post. Post a comment or leave a trackback: Trackback URL. Wow, I saw this movie the other day, it is seriously salivating. So good. We ended up ordering takeout http://www.deliveryhero.com.au/sydney/ and keeping it low key. I did end up having crazy food dreams though!